Whether or not you’ve gone through the new roofing or re-roofing process before, there are things you should know. Do you know what to look for in a roofing or re-roofing estimate? What about liability insurance that covers you throughout the entire process? Do permits need to be pulled before the roofing process begins? What if dry rot is found during the re-roofing process? What kind of decking should go underneath the roofing shingles? Will you be finding nails in your tires for months after the project is complete? The more you know about the process, the more likely you are to catch potential issues before they become expensive problems. You’d never allow anyone in your home without knowing exactly what he’s doing. Just because the whole roofing process is outside, why should your roofing company be any different? 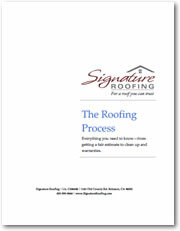 Request your FREE Roofing Process Guide from Signature Roofing today. Just fill out the short form below. No one will contact you unless you ask us to and you are under no obligation whatsoever. Would you like to be notified of special news, announcements or promotions? Our 17-page roofing process guide covers everything you need to know—from what to look for in an estimate and what to expect during clean up to roofing company warranties. Download The Roofing Process, our 17-page guide to everything about the new roofing and re-roofing process.